Finding seashells at the beach is one of the best things about summer break! Maybe it’s just being at the beach that I love so much, but finding super cool seashells is an added bonus for sure. 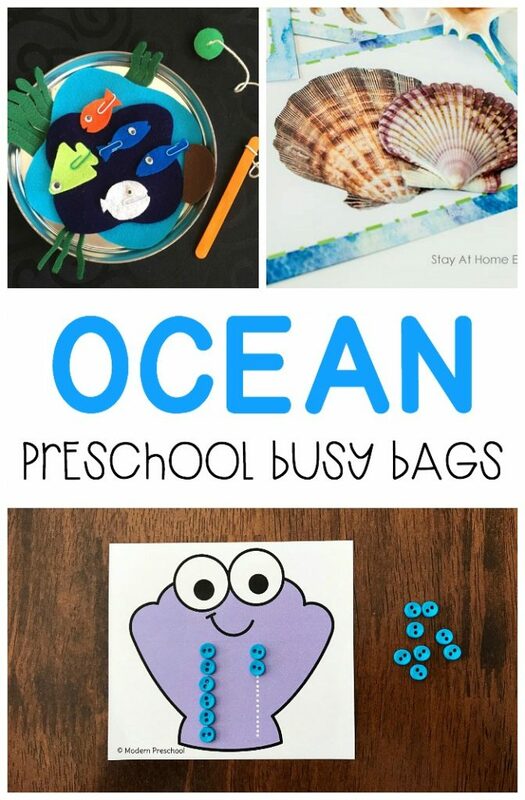 Just like at the beach, seashell learning activities are always a hit with preschoolers. 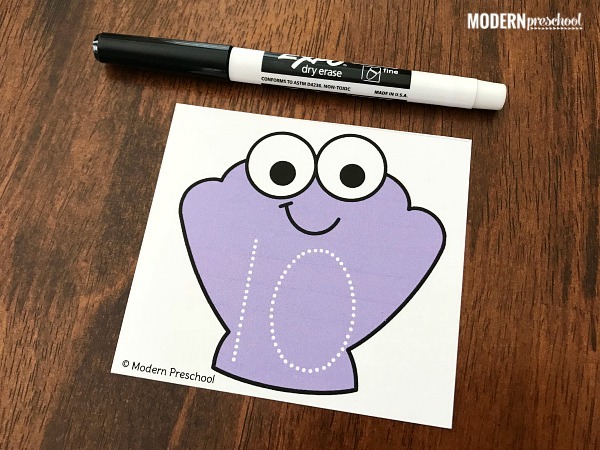 Our seashell pre-writing number tracing cards definitely fit into that category. 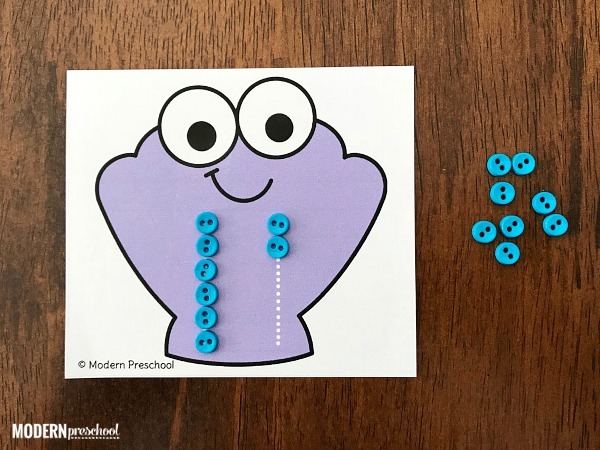 They encourage number formation, number identification, and fine motor skills. Print your set today! 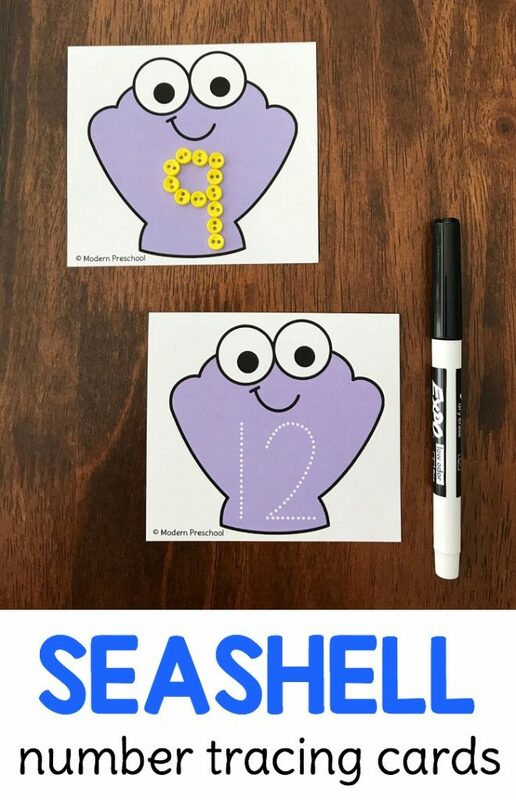 This free printable set of seashell pre-writing number tracing cards includes the numbers 1-20. Each card has a seashell on it with a dotted line number printed on it. Prepping this math center takes no time! Simply print the number tracing cards from the pink button below. Cut the seashell pre-writing number tracing cards apart on the gray dotted lines. Laminate the cards individually after cutting them. This keeps the cards intact when using with dry erase markers. Place the seashell pre-writing number tracing cards in a small basket or on a tray in a pile. Add mini buttons or dry erase markers to the tray. Now you’re prepped and ready to play and learn! 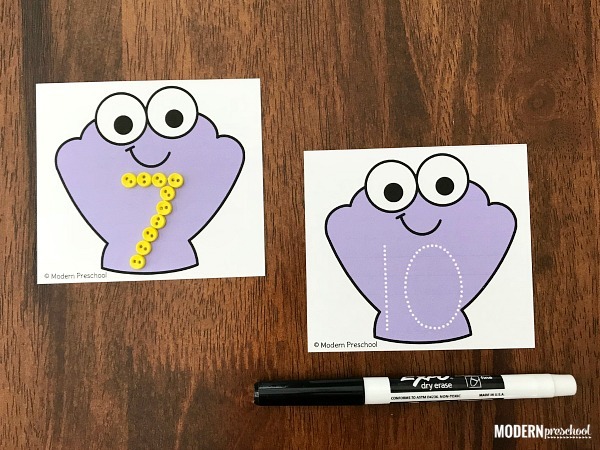 I love the way this math printable center can be adapted to fit the needs of your little learners, or to be used with the materials and supplies you have on hand. In my own classroom, we focus on how to use dry erase markers and permanent markers without getting them on our clothes. Before that skill is mastered (or as close as you may get! ), I like to find alternatives to using these markers unless a teacher is sitting with the center. Pick a card and set it on the tray. To complete each card, identify the number and trace it with your finger first. Then use a dry erase marker to trace the number using correction number formation. After the dry erase marker is erased, trace the number again with mini buttons. Tracing the number using number formation multiple times helps reinforce number skills. When you are finished with the math center, simply clean off all of the cards and store them in a reusable freezer bag to use again next time! No matter which way you use the seashell pre-writing number tracing cards, lots of number skills will be practiced. Fine motor skills will be strengthened too. Before you print the cards from the pink button below, don’t forget to check out the other ocean themed activities below! Thank you so much for your freebies. I will be teaching two of my grand children this year – ages 3 & 5. This is perfect!